I met, Kelly McLearran at the Speedworld Nostalgia Drags and found out she’s was more then just the pilot of this 10 second quarter mile 1963 Ford Falcon. As if that blasting 10’s with 2 less cylinders than the average racer weren’t enough, she’s also known to turn a few wrenches, they run E85 instead of race fuel and I’m delighted to say she’s a breast cancer survivor. If you didn’t know already I’m a Ford Falcon fan. Pops was a Ford mechanic for 25+ years, so when it came to drag racing, sprint cars or of course NASCAR, we were always routing for the blue oval boys. 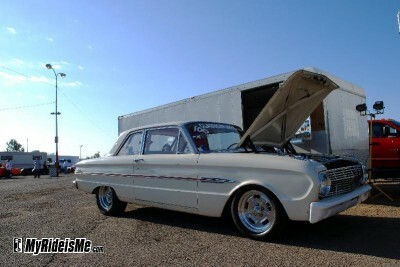 So when I found this killer home built Falcon at the drags way up town at Speedworld, I had to take a look. I’ve seen this car before and heard about the woman driving it from the forum at fordsix.com. Between rounds, we had a chat about how she made a Ford six cylinder run that hard and why, My Ride is Me. Kelly’s website, Quarter Mile for a Cure, tells her story. On her 30th birthday, she found out she had cancer and joined several relatives who had also been diagnosed. 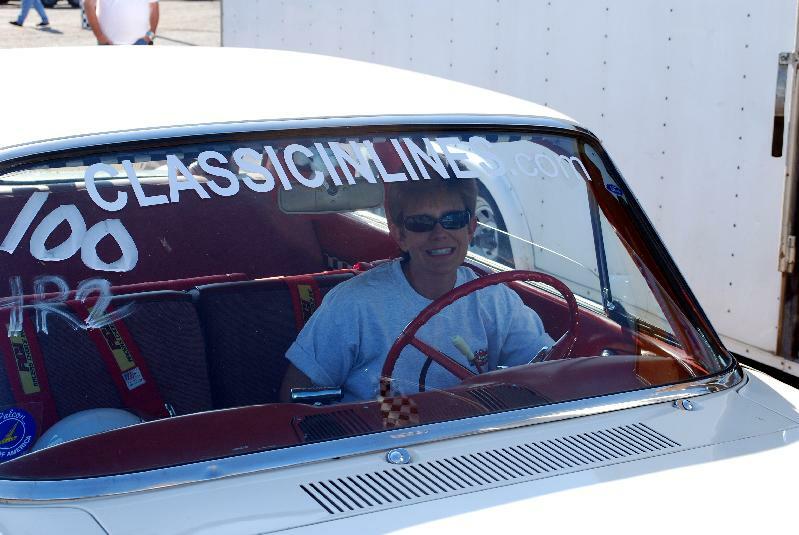 While receiving Chemotherapy, she made the decision to go racing. With her new found zest for living, she didn’t want to be on a crew either, she wanted to drive. She started out running her husband Will’s 69 Mustang with a mostly stock 351. She liked it, but that was their driver too. I know that feeling. You don’t want to run really hard in a car you’re planning to drive home when the race is done. Then they found the Falcon. With a little looking a Falcon Futura that already had a 5-lug 9 inch came along. It still had the stock 170 cu. in six. With seat belts fastened, she tore up the strip running 20 second passes all day long. The six cylinder car brought on alot of attention, but like every true drag racing enthusiast, she want to go FASTER! 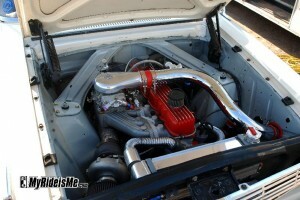 It would’ve been easy to drop in a V8, especially since Will was running a darn serious 86 Mustang with a turbo-V8. (pics at their website) But Kelly’s Falcon was like her, a fighter, so she chose a little tougher path by sticking with the inline 6. Don’t be fooled though, this 250 cube “little” six has all the go-fast goodies… how about a Classic Inlines aluminum head and 450 cfm four barrel Holley stuffed by a turbo that’s been dialed up to 18lbs when they’re running all out. It hasn’t been easy though! This is their second (third?) motor now. 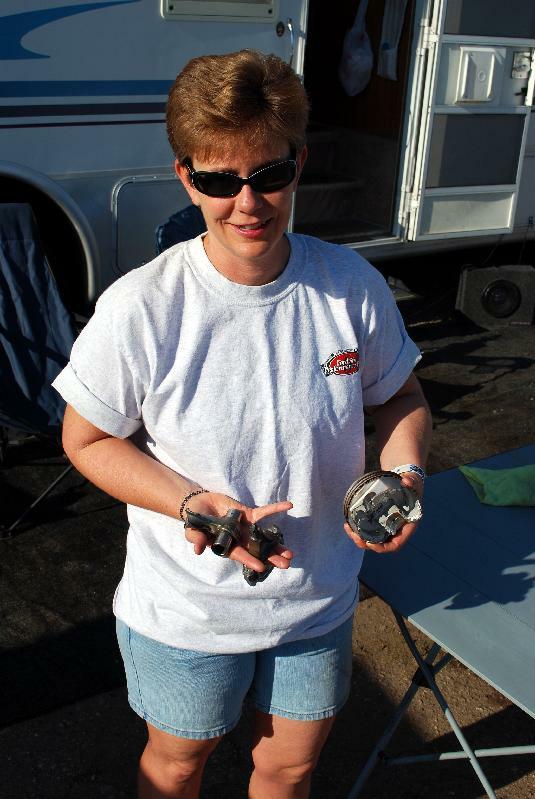 In this picture, Kelly’s holding the grenaded parts from a failed motor. On top of running the quirky-cool inline 6 and beating Hemi cars running a best of 10.95, The McLearran’s are also Green Racers! Instead of dropping 9 bucks or so on racing gas, they chose to use the cleaner burning E85. In case you haven’t seen it, E85 is 85% Ethanol and 15% regular gasoline. In Arizona, it’s also just about 100% hard to find. At 103 octane (compared to premium fuel’s low 90’s octane), E85’s potent stuff and perfect for racing a turbo since alcohol runs super cool (think frost forming on the intake). Will told me the E85’s like it’s own intercooler on their Falcon. To run E85, you need to supply lots of it! Your fuel pump and fuel feed system needs to supply about 25% more E85 than if you were running gas. That’s cause the stoichiometric (big word meaning balanced) combustion ratio of fuel to air for E85 is about 25% higher than what you find with gasoline. You could also say the energy per gallon of E85 is less than gas. That’s also why your fuel economy is worse too. It was my pleasure to meet Kelly and tell her story. I hope to see her and other fast Ford Falcons at other races in Arizona. If you see Kelly on the other side of the track, don’t let the quiet idle and the friendly smile fool ya… you’re about to get smoked. Thanks so much for taking the time to ask about our story. Racing is truly a labor of love, but when we can also promote a good cause, we appreciate any positive press. We are currently down again due to timing chain failure, but are working on reengineering to strengthen this weak link. We’ll keep everyone posted. You said, “Great story about your Wife and car.” Just to be clear, Kelly’s not my wife. She’s a friend from the Nostalgia drags and from the fordsix.com discussion board. I hope we become good friends, but I think her husband will won’t like it if we get married! top end when “boom”. The timing chain let loose. I still had an 11.27! ported head and improved cam timing. Hi! I’m a Falcon fan and as Clifford says 6=8. We use to prepare AMC inline sixes with 318 cu. pistons and they ran very fast. A woman in a fast car, Yes. We read your story with great interest, first (admittedly) to read how you hopped up you’re inline 6, but you are truly an inspiration on a more important level. Good on you for beating the awful “C”, (and the competition for that matter).